I’m not quite at that point with my new book, but I’ve been thinking about this because a friend of mine here in Southern California whose book will be out this fall was recently at work on her index. She’s making her own again, as she did for her first book, although she said she’s just going to do a very basic index because if people want to mine her book for discrete information, they’ll go to Google books and do keyword searches either to determine whether or not they should buy the book, or to use it as a finding aid next to the physical object itself. At first I thought this was very sensible–why invest that time & energy in re-reading your proofs yet again, when few if any readers will get the benefit of the exercise? But then I reconsidered. I actually liked making the index for the first book. It was easy and even fun compared to the copy edits or the page proofs, and it allowed me to shape the way that some readers might experience the book. If we want publishers to continue publishing our books as material objects rather than pixels and electronic pulses, maybe we should think twice before giving people an incentive to leave the codex behind. What do the rest of you think, as readers and writers? If there are any people in publishing out there today, I’d especially like to hear from you on this point. What is the use of a good index? For me, this one is easy. Do the index because there is absolutely no guarantee that readers in all places around the world at all times (by which I mean the future since who says Google Books will still be around in 100 years?) will have access to a full electronic version of your book. 1. A good index will include implicit subjects mentioned in a passage, even if the word in question doesn’t appear on a page. For instance, depending on the context and the book’s focus, a page that mentioned “teenagers” might be properly indexed under “age” or “adolescence,” even though neither word actually appears on the page. Until we have word searches that pull up not just unique words or parts of words, but whole semantic fields, implicit subjects will remain a problem. The same is true, mutatis mutandis, of multiple names for a person or thing—a book on 19th-century English history might refer to “the Prince Regent” before 1820, and “George IV” after his accession. 2. Many publishers make Google books available preview-only and limit the number of full pages that are shown. And for the pages that are shown only as OCR text, the page numbers aren’t always accurate. Thanks–I agree with both of you on all points. And Brian is right that Google books doesn’t always furnish page numbers for keyword hits. I was going to make Jonathan’s point about the ephemerality of our digital environment, but I thought that might sound a little dystopic or paranoid. But I’m glad he went there! This of course jibes with what I’ve written about here recently, that is, the archivists’ assumption that as we move forward in time the material leavings of our intellectual lives become more and more difficult to capture and preserve. I did my own indexes for both of my books. Easy things like place names can be done by anyone, but the index also allows you to shape how people experience the book by including more abstract concepts. Definitely worth the effort. (1) Unless your book is primarily about specific people, places, and events, it’s going to be difficult for a professional indexer who is *not* a specialist in your field to determine what your readers might want to find, and which of your ideas are primary vs. secondary. (2) If you sketch out index terms while you do page proofs, it forces you to slow down and take special care on both jobs. Better all around. There’s a small bit in Cat’s Cradle by Kurt Vonnegut about the dangers of indexing your own book- it can reveal things about how you think about the topic. The novel is worth reading in any case, if you haven’t. How the fugge do you make an index? What I’m imagining sounds absolutely fuggen miserable. Without having contemplated a completed/copy-edited/proofed book manuscript, I’m also in favor of extensive indexes. I often tell students to look at a book’s introduction, conclusion, first and last few pages of the chapters they’re interested in, and the index–so it’s pretty crucial that those indexes are useful. I think it’s unrealistic to expect that students will be savvy enough to know they can find a full text available on Google Books–and teaching in England, there are some restrictions on which US Google Books get made available here. I don’t think I’ve ever seen indexing referred to as “fun” before, but what I have enjoyed is, in reading authors’ acknowledgements, seeing a shout-out to the graduate student or RA who helped to create the book’s index. That wouldn’t be an option for me, yet (none of my own PhD students, and we don’t have departmental RAs), but it’s kind of cool to see those graduate students, some of whom are now historians in their own right, making appearances in important books early on in their careers. I made my own index and I loved it, but then, I spent years proofreading and revising indices when I worked in academic publishing, so I’d probably spent more time thinking about what makes a good (or bad) index than the average bear. I also enjoy that kind of task — both the precise, orderly part and the bigger-picture, holistic part: writing an index encourages an author to think in a different way about her book, seeking out other patterns and connections and imagining the needs of diverse readers. So far, I’m not detecting a great deal of controversy as to the value of a good index, just differences of opinion as to whether it’s a good idea to do one’s own or to farm it out. Although I always appreciate a good index, when it came to producing my own, I considered it a chore. For my first book, I was intimidated by the enormity of such a project so very gladly hired an indexer who I thought did a great job. I did the index for my second book and didn’t find it nearly as difficult as I’d anticipated, but it didn’t make me think any more deeply about the mss. Many, many years ago, while in grad school, I supplemented my TA stipend by indexing books for professors. The first indexes I did according to the instructions provided in the Chicago Manual of Style, which assumed I would use file cards. After I acquired my first computer (that’s how long ago this was), I adapted their system by keeping two files of terms, one in page order, the other sorted every day into alphabetical order (so I could see my term choices and keep them consistent). It used to drive me batty when people would say, “can’t you just do a keyword search?” First of all, how can you know what the keywords might be until you have read the book and noted them? And second, as others have pointed out, you aren’t just indexing words, you are indexing ideas. Indexing is an act of interpretation. And third, what exactly could I search? I had page proofs, not computer files. Back in the day, there was a distinct difference between the programs that ran on my desktop machine and those used by publishers to set type. Ironically, when my first book came out, I was too swamped with teaching to index my own; I paid someone else. Then I found the index inadequate and added terms. going to hire someone. It’s such a tedious and time consuming process, and I think I have better uses of my research time. Plus, I now have institutional support to help defray costs; my previous institutions offered zip, and I was sufficiently cheapo (and at my first institution sufficiently underpaid) not to want to shell out around $1500 to have it done. 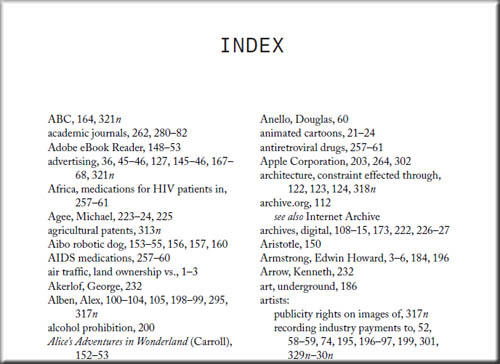 I’m all for a good index, though, and one can find good indexers. I’ve always had someone else do the index for my books. Usually the proofs arrive mid-semester and I barely have time to deal with those let alone do the index too. I’ve done two indexes for my own books and I didn’t find it ridiculously time-consuming – although yeay for computers. It also highlighted that I was spelling some people’s names differently in different places, which I hadn’t noticed (in my period people don’t have consistent spelling of names and they aren’t always famous so don’t necessarily have an ‘accepted’ spelling)! I didn’t use any compiling software (because as others note, keywords are only good for names and similar ‘facts’). I did read a few indices in similar books and adopt some of their terms to start with, as I thought that it would be useful to users in the field if we used shared terminology. As someone who still uses indices (and not just for real books, but on google too! ), the trend towards ‘names only’ or ‘basic info’ indices is just pointless. If it’s not key ideas and concepts, then what is the point? You’ve all convinced me, if I needed any convincing! I’ll do my own index. There are all kinds of funky things I can highlight in this book that I don’t know if a professional indexer would pick up: how did women in different cultures deal with menstrual blood? What did people eat for breakfast? What were their sleeping arrangements? Etc. There are also some early American celebrities who get quoted in the book that people might want to know about: John & Abigail Adams, their daughter Abigail Jr., Thomas Jefferson, his daughters Martha and Maria, and Cotton Mather, for example. Brought here by your July 2017 Twitter post, and thought I’d chime in. Having just had a professional index my third book, I’d never do it myself, I suspect (and didn’t do it myself for the other two, either). Maybe I just got lucky, but they really pushed me to think about how to make it most useful to readers I wasn’t necessarily even thinking about. To take one example: It’s a book about poverty on film, and in the text I sometimes note where the film is set, sometimes don’t, depending on whether it seems pertinent to the discussion. The indexer thought *every* film mentioned in the book (there are some 300) should be cross-referenced with its setting, since they thought this could be interesting and useful. I had to be persuaded, since that seemed liked a ton of work, if nothing else. So the indexer then did all the work to identify those locations. Not only had I not thought of that, but would likely not have had the time/energy to make it happens. The book is, I’m certain, better and more useful for that indexer’s work. Let the experts be experts I say, and I’m not an expert in indexing! Thanks for writing–that’s an interesting perspective! I know I’m late to the party, but I love a good index. My area of research has me reading a fair amount of scholarly work from Central and Eastern Europe, especially from the former Peoples Democratic Republic of Megalomania. The Megalomaniac Academy of Sciences and the affiliated academic presses have published a lot of worthwhile stuff before and after the fall of State Socialism in 1989. The only problem is that they tend to use a names only index, if they bother to provide one at all. This makes their books hard to use as research tools. So I encourage you to stick with an artisanal, hand rolled index in the Anglo-American tradition. Is there any chance you could enroll a really smart undergraduate or MA student as a research assistant for a semester to help you out? They might be able to do it for some cash or an independent study credit. I dreaded doing my own index for my book and ended up enjoying the whole process. Although the book was composed on computer I used the page proofs, small index cards, and a pen. It ended up being more relaxing than almost any other part of the book process. I can still remember being upstairs, doing it, idly listening to something like a baseball game on the t.v. below, not being distracted, feeling finally like the thing was gliding toward the finish line. When the stack of cards was about to tip over I entered them into a file and attached it to the rest of the ms. I may be suppressing the frustrating parts because it was a good while back, but it completely disabused me of fearing the indexing. I hate it when I’m trying to quickly find something of use or value in a book that I don’t intend to read through and find an index with twelve “Fs” twenty “Js” six “rs” and invariably, no references to what I know is in there, and end up finding by hand. Circumventing that problem with google books is not a good substitute. What I want is always on “pages 313-322 are not a part of this preview.” Always. What is the ratio between books taken off the shelf for scholarly purposes that are “mined for discrete information” and those that are savored for the deep intellectual substructure and specific arguments? I’d say pretty high in favor of the former. This is why off-siting books to remote storage areas is such a disaster. Matt L’s comment about the “artisanal, hand-rolled” index cracks me up. But srsly? My book–although it took me 15 years to write it–is only going to be 200 pages, maybe, exclusive of the footnotes. So it’s not too long, and it will allow me one last pass at picking up on all of those grungy things I want people to see in my book. Just a side note on bad indexing: An African history textbook, where the entry for “Women” said “See Family Structure.” Not sure if the author or a professional indexer was responsible for that unfortunate entry. Perfect! Women make no other contributions to the world that historians are bound to notice or analyze. How is this still acceptable? I think it’s great if you can do it, but I wouldn’t kill myself. I indexed my first book, and it was fine; I was fairly stressed when finishing my second, so my mother (who had done professional indexing) offered to do it for me. When she got sick, I finished it. Like Feminist Avatar, I discovered names I had misspelled or spelled in multiple ways, that my eagle-eyed readers and copy-editor had missed. So there are advantages to doing your own. On the other hand, a good indexer may see things that you don’t know are there for the subject entries: people often end up looking in our books for things that are there but were not part of our agenda, and we may not see them. Kathie’s example of bad indexing (though that may say more about the book) is pretty egregious. My favorite bad index is a local study where everything is indexed under the place name. I was a research assistant at a major art museum about five years ago and I had to fight to have an index in our exhibition catalogue. (The task, of course, then fell to me.) I spent the project complaining, loudly, about catalogues that didn’t have indices, so there was no way I was going to be silent while a project I worked on made the same omission. If a book is going to be a tool for researchers, not just something pretty on a coffee table, it needs scholarly apparatus like a proper index. The museum’s editorial staff was totally fine with leaving it out though. I was given very little space, so I didn’t get the kind of detailed, “hand-rolled artisanal” index I would have liked (plus I was given two days, I think, to pull it together), but at least I got more than an index of plates or artist names. Great story, H. Yes, when one makes loud arguments for something to be done, it’s best to be prepared to go ahead and do it! The current and future generations of scholars who consult your book will be so grateful, especially because it sounds like they’re fairly exotic in exhibition catalogs. Farm it out! Hu-u-u-uge waste of creative energy when there are professionals who can do it for a thousand dollars or so. I did my own for the first book, and it was fine, because my Dad had just died and I was incapable of other work. But for the Since 1970 collection, we farmed it out and it was done in what seemed like a nanosecond. Meanwhile, I was reading mysteries and eating bonbons. I’d consider it for an edited collection of essays that I didn’t write, but this is my book, so I know it best. It’s also not too long (yay!). It will probably take me about one day to do it, one night to sleep on it, and a few hours the next morning to review for thoroughness. I’m glad to see that the index wouldn’t take that long, Historiann. For my first book, I hired a professional indexer, and she saw some things in it that I didn’t realize were there, which was a good thing. For this one, I may do it myself, though. None of your commenters mentions using professional indexing software like Cindex, which makes sense considering that most of us would have to publish 10 books to afford it. Does anyone use something other than Word? I have a friend who’s going to hire an indexer & she also mentioned the seeing some things that you don’t aspect. Not a bad idea, but authors really should give the outsourced index a once- or twice-over to make sure everything they want is in it.